COARSEGOLD, Calif. (KFSN) -- At the Coarsegold Rodeo Grounds during the Detwiler Fire it is all hands on deck-- 24 hours a day. Displaced people come here seeking shelter for their animals. Groundskeeper Donny Linderholm said they are caring for dozens of animals and for some evacuees these horses are all they have left. "We have one family that lost everything-- lost the barn, the property, the house-- displaced. No family in California." Some horses were spray painted with phone numbers and addresses just before they were rescued to safety. "The owners were starting to get surrounded by the fire last ditch effort, they were going to open the gate and cut them loose," said Linderholm. While those horses made it some animals are on the run somewhere near the fire. Paula Brocchini had only five minutes to get out and could only grab three of her pets. "We drove down the hill and the two goats actually followed us-- we had to turn around and send them back up and leave food for them to stay because they were trying to follow the baby that I had in the truck." "I have a list of hundreds of horses and hopefully we will be able to reunite you quickly," said Douglas A. Binnewies, Mariposa County Sheriff. For some families, all they can do is hope to go home to what matters most. "When you're told you've got five minutes nothing matters but your animals and yourself," said Brocchini. 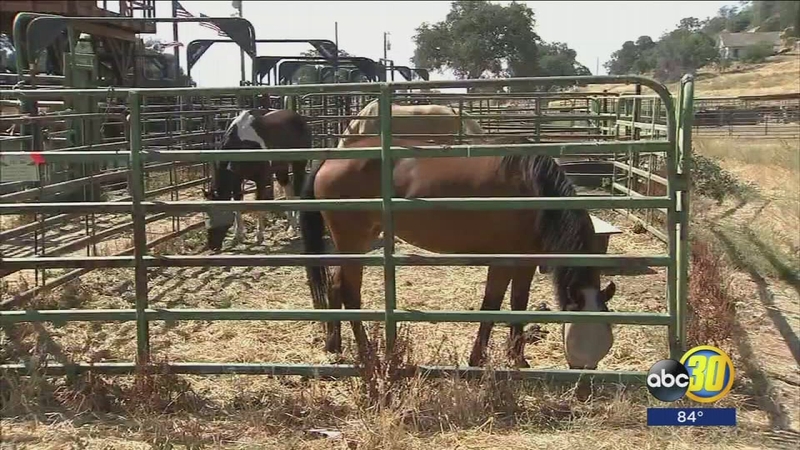 Two horses were found and brought to the Coarsegold Rodeo Grounds with just a phone number on their bodies. The groundskeeper said he called the owner and said she was in tears overwhelmed with joy. If you are missing animals please call the Mariposa County Sheriff and let them know.